during a mortar attack on his home, to UN Secretary General Ban Ki-moon. I address you after your announcement to Prime Minister Benjamin Netanyahu, to establish an international investigation Committee to investigate “Israel’s crime” in the recent fighting in Gaza. Then, last Friday [August 22], Daniel was killed. All the precautions we had taken failed. Daniel, 4.5 yrs old, was killed in our House, while playing with Yoval in a tent built indoors and not outside, because it’s dangerous. He was killed from a mortar shell that was shot by terrorists from Gaza, he died in our hands. Daniel died in front of his little sister and his best friend Yoval, 3.5 years old; he died in front of Uri, only four months old and right before our eyes, his mother and father. We failed. We couldn’t protect our beautiful and talented baby. 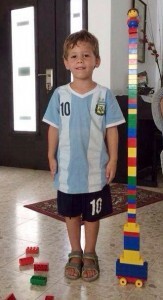 Daniel was killed from a mortar shell that was fired by Hamas members from an elementary school for boys in Gaza City. It wasn’t a stray shell. It wasn’t accidental death. From that school terrorists fired deliberately at the kibbutz to murder civilians — children, women, old people. This time, they also achieved their goal. Daniel was killed almost immediately. Daniel’s father, Doron, covered him with a blanket while crying bitterly and we escaped from home with two small children, leaving our precious son behind, in order to protect them from bombings that continued to explode around the house. Yoval, Daniel’s sister, saw the terrifying sight and understood that something terrible happened. It is unbearable to watch that little child staring at the wall, in overwhelming silence with teardrops from her eyes. This week, during the “shiv’ah”(Jewish ritual of mourning) at Doron’s parents home, we heard of your decision to appoint an international investigation committee to investigate “Israel’s crime” during the recent fighting in Gaza. You informed Prime Minister Benjamin Netanyahu half an hour after our Daniel was killed, perhaps while he was lying dead in our living room, covered in a blanket. The investigation committee will examine the “crimes of Israel” during the fighting. The investigation committee is not asked to investigate how terrorists shoot out of U.N buildings and schools.The committee is not asked to investigate how inside buildings of the United Nations and in hospitals in Gaza terrorist infrastructure flourishes and is maintained over time, or how from these places terrorists depart for activity aimed against innocent people. It won’t investigate how Hamas abuses the Palestinian people, and how its members force residents of Gaza, even children, to dig tunnels aimed only for terrorism against Israel.It won’t investigate how after these excavations, carried out under duress and in slave-like conditions, the Hamas murdered the diggers, even the children, just to be sure they won’t be able to pass information to Israel. Does your silence indicate consent with the abuse of the Palestinian people and the Israeli people? Let me tell you some more about the history of our lives here, on the border with Gaza. My husband’s parents, Doron, also live near the border fence and three and a half years ago a Qassam rocket exploded and destroyed their home. Up until a few years ago they had good relations with the residents of Gaza. They hired workers from Gaza to work in their fields and Paulina, Daniel’s grandmother, drove them home – to Rafah, every evening after work. They used to invite each other for weddings and other celebrations and often traveled to Rafah or Gaza to enjoy life at cafes there.All that ended when Hamas rose to power and ordered the civilians who worked in Israel to kill their Israeli employers; otherwise, Hamas would hurt their families. Daniel’s grandparents used to tell us this, longing and hoping that the good proximity will resume. They even found ways to maintain contact with their friends from Gaza during the mortar shelling. Like the parents of Doron and their friends from Gaza, we want to live in good proximity, in peace and security. It is our hope that our neighbors, the people of Gaza, will be able to live peacefully in their homes and build and develop their beautiful country. We believe that the vast majority of the people on this planet do not want to see the sights of blood, tears and fire of the radical Islam movement, but to live peacefully, enjoy kid’s laughter, wait for a better tomorrow. We do not seek the people responsible for our Daniel’s death.